Anna Pavlovna Pavlova (c. January 31, 1881 – January 23, 1931) was a famous ballet dancer of the early twentieth century. This legendary prima ballerina was known for her daintiness, seeming frailness, and lightness on stage and in choreography. Her movements had great finesse, delicacy, and emotional dimension. A native Russian, Pavlova remained largely committed to the classic style of ballet for the duration of her career—even while contemporaries were introducing revolutionary innovations to dance. 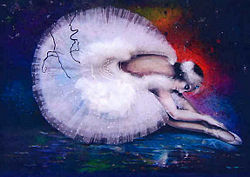 Pavlova as a swan in Michael Fokine’s The Dying Swan marked her rise to fame. It was a profound allegory for the ballerina: The awkward body, when put through a series of unnatural steps, becomes superhuman, otherworldly, more graceful even than the symbol of grace which it imitated. Pavlova revolutionized the ideal for ballerinas. Because of her extremely arched feet, a pointe shoe with leather soles and a flattened box at the toe for added support was created for her and became the modern ballet shoe. More noteworthy was Pavlova's entrepreneurial endeavor of her own ballet touring company, which created pathways for women in ballet to make their own place in the world of dance. Between 1910 and 1925, her company traveled 300,000 miles and gave nearly 4,000 performances. Pavlova was born in St. Petersburg, Russia, two months premature. She was officially born to laundry-woman Lyubov Feodorovna Pavlova and reserve soldier Matvey Pavlov. Yet, Pavlov may not have been Anna’s biological father, as many suspect Anna was the illegitimate offspring of Lyubov and a Jewish banker, Lazar Poliakoff. The young Anna Pavlova herself adopted the name Anna Pavlovna Pavlova instead of Anna Matveyevna Pavlova, with reference to a mysterious Pavel—supposed first husband of her mother, who died when Anna was two years old. When she was eight, her mother took her to a performance of The Sleeping Beauty, at St. Petersburg Ballet Academy, and Pavlova experienced an epiphany. She knew in that instant that ballet was her life’s calling. That year, she applied to the Imperial Ballet School—a privileged dance institute—but was rejected because she was too small. She was asked to return when she reached her tenth year. Two years later, she was admitted to the Imperial School of Ballet. Because of her talent and physical qualities, Pavlova soon attracted attention from her teachers, among whom were Pavel Gerdt, Christian Johansson, Ekaterina Vazem, and the famous ballet master Marius Petipa. There were some disagreements as to her physique and her good looks, but not about her being something “special.” At the annual graduation performance of 1899, Anna made quite an impression on the jury, and it was announced that she would join the Imperial Ballet at the Mariinsky Theatre later that year, as a coryphee, that is, bypassing the corps de ballet to assume major roles immediately. The Mariinsky Theatre was home to Russian ballet and opera since the 1860s, and had become a mecca for both Russian and international artists. Pavlova made her debut on September 19, 1899, in La Fille Mal Gardée. Pavlova rose through the ranks quickly, as she was a favorite of Maestro Petipa, a man of great influence at Mariinsky. 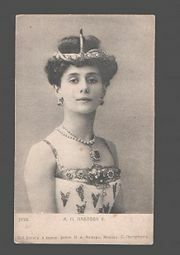 When prima ballerina Mathilde Kschessinska became pregnant in 1901, she coached Pavlova in the role of Nikya in La Bayadere. Kschessinska was certain Pavlova would fail miserably in the role, as she was considered technically weak. However, fans were greatly impressed by her delicacy and grace. During the season 1901-1902, Pavlova's reputation became firmly established with the knowledgeable St. Petersburg ballet-goers. She was second soloist in 1902, première danseuse in 1905, and finally prima ballerina in 1906, after a resounding performance in Giselle, for which Petipa modified the ballerina's dances to suit her specifically. Today, this revised version is still performed at the Mariinsky. Anna’s legions of fans took on a special name for themselves: the Pavlovtzi. One among them looked upon Pavlova especially favorably: Victor Dandré, a minor aristocrat and member of the St. Petersburg municipal council who had followed her career from her schooldays. Pavlova was already an acclaimed ballerina when, in 1905, Michel Fokine choreographed The Dying Swan for her to the music of Saint-Saens. It became her personal emblem. As seemingly absurd as it was for a woman to imitate a swan because of their dissimilar body parts and that the bird’s grace is only seen while swimming, Pavlova en pointe and in motion expressed the role beautifully. The Dying Swan was not about a woman impersonating a bird, it was about the fragility of life and the passion with which people hold on to it. Pavlova's sheer dramatic intensity forcibly conveyed this truth to the audience, and the work was an instant success. In 1907, she began her first tour to Moscow. When Russian impresario Serge Diaghilev launched the Ballet Russes in 1909, Pavlova was one of thirteen dancers in the company—taking a principal role. The company created a sensation in Western Europe because of the great vitality of Russian ballet compared to what was current in France at the time. It would became the most influential ballet company in the twentieth century. Originally, Pavlova was to dance the lead in Mikhail Fokine's ''The Firebird'', but refused the part, as she could not come to terms with Stravinsky's score. The role went to Tamara Karsavina instead. By 1910, she was appearing at the Metropolitan Opera House in America. In the meantime, in St. Petersburg a scandal was brewing: Victor Dandré, whom Pavlova was known to be close, was accused of embezzling government money. Following Pavlova's return to Russia, he was released on bail, after having promised not to leave the city. Within a few weeks, Pavlova was performing in London for Diaghilev, and early in 1912, Dandré slipped out of Russia to join her. In 1914, she was traveling through Germany on her way to England when Germany declared war on Russia. Her connection to Russia was, for all intents, broken. Dandré remained by her side as her touring manager. Pavlova and Dandré settled permanently in London. She rented a house, which she later purchased, in Hampstead. This house, which became known as Ivy House, was to be the base for Pavlova's world tours. She gathered her own company and traveled widely, presenting ballet all over the world—even in places where classical ballet had never been seen before. Millions must have seen her dance, and she attained the status of a super star. Perhaps the only weakness of her career was that she chose too often to dance “pretty,” self-choreographed dances to insignificant and sentimental music, and declined roles of an experimental or innovative nature. She was considered by many people to be unintelligent. 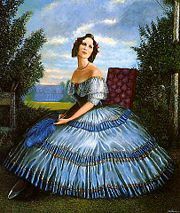 Unlike Tamara Karsavina, with whom one could converse about anything, Pavlova showed no interest in anything but her next performance. These faults, however, were insignificant when compared to the incandescent beauty of her dancing, her bourees like a string of pearls, as the ballet writer Cyril Beaumont put it. For the rest of her life, she toured the world with her own company and kept her home in London, where her exotic pets were constant company when she was there. Victor Dandré, who was also her companion, may have been her husband, although she deliberately clouded this issue. 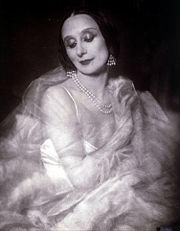 Anna Pavlova died of pleurisy in The Hague, Netherlands, while touring, three weeks before her fiftieth birthday. She received medical treatment, but it was unsuccessful. Anna had said "If I can't dance then I'd rather be dead. So can you prepare my swan costume?" Her final request was to hold her costume from The Swan. Her last words were "Play that last measure very softly." In accordance with ballet tradition, on the day she was to have next performed, the show went on as scheduled, with a single spotlight circling an empty stage where the dancer would have been. She was cremated, and services were held in a Russian Orthodox church in London before burial in Golders Green Cemetery in London. Pavlova forever changed the ideal for ballerinas. In the 1890s, ballerinas at the Mariinsky Theatre were expected to be strong technicians, and this usually meant a strong, muscular, compact body. Instead, audiences became enchanted with Pavlova and her frail, ethereal look. Pavlova was thin and delicate-looking; she was perfect for romantic roles such as Giselle. Her feet were extremely arched, so she strengthened her pointe shoe by adding a piece of hard leather on the soles for support and flattening the box of the shoe. At the time, many considered this "cheating." But this became the modern pointe shoe, as pointe work became less painful and easier for curved feet. Anna Pavlova was often called the consummate ballerina because she maintained the same elegance on and off stage. The public loved her image, her fashion, and her aura of satin and roses. But she made them adore her with her fierce drive and undaunted presence, proclaiming, "God gives talent, but work transforms talent into genius." 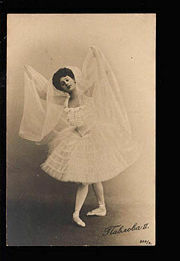 Pavlova was instrumental in bringing ballet to the masses, converting new fans everywhere she went and moving them to tears with her most famous showpiece, The Dying Swan. 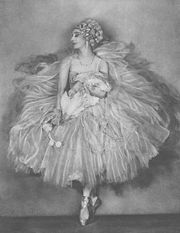 Modern dancer Ruth St. Denis has said "Pavlova lived on the threshold of heaven and earth as an interpreter of the ways of God." All links retrieved November 19, 2016. Anna Pavlova in Australia – 1926, 1929 Tours, National Library of Australia. www.nla.gov.au. Creative Quotations from Anna Pavlova. creativequotations.com. This page was last modified on 19 November 2016, at 16:32.